It certainly looks like it is 8x8 which means buying more walls. The inside corner pillar is brilliant and could probably fit with KS1 stuff as well. The need something like this for the cavern sets. If you right click on the photo and open it in a new tab, you can zoom in a little closer to see a bit more detail. You can make out that the lines that make up the different stair sections. There's a straight 2x2 stair, an inside corner stair, and an outside corner stair. Here's a new teaser photo for you guys, before it goes out to social media. Hope you're getting as excited as we are. Thank you, Nate! This is most excellent! The top of the pyramid is four pieces... but difficult to tell if they sit on top or are actually a set of stairs.. The stairs are especially awesome! Are they each a piece with four steps? Doom to our wallets is right. I can't tell if it is stacked 2x2 floor tiles in the upper left corner or a double thickness floor tile. It looks like the DoD is going to be much more three dimensional than the KS1 dungeon. Doom to my wallet !!!!!!!!!!! If I had a better Wisdom score I might be able to resist! But it looks pretty hopeless already. 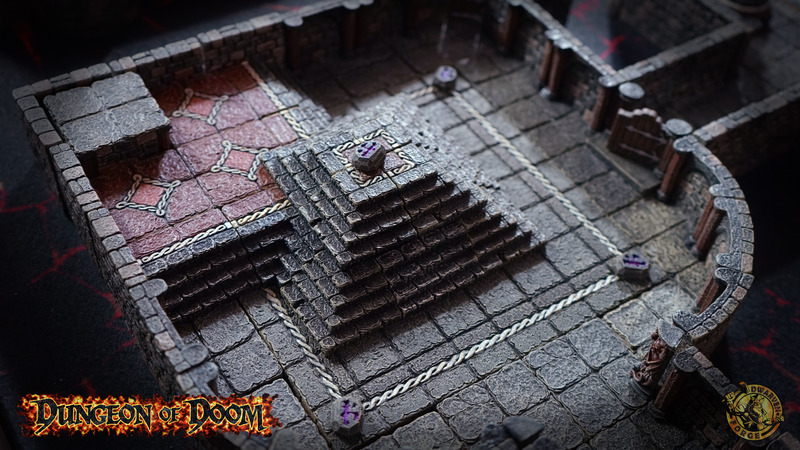 He is also in that much larger panoramic dungeon shot that came out in early May. This is a better shot of the shy little devil. I know that Nate has taken some close up shots of it... He's probably saving them for the KS. I can tell you it was a fun one to do. Good catch, pacarat. The picture doesn't show the corner piece very clearly does it. Maybe the great Beankeeper will toss one out later that shows it off a bit more. Hope we can get a bunch as an add-on set. I can see these all through my catacombs. I can't believe I missed the corner filler after sculpting my own for the caverns.